Income is arguably the determinant of all determinants of health. It has far-reaching impacts on the quality of life and is pervasive over the life-course. 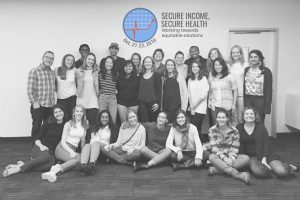 That’s why a team of 40 public health students hosted the 9th annual DLSPH Student-Led Conference, Secure Income, Secure Health: Working towards equitable solutions. Our vision was to create a platform for critical thinking on income insecurity and its relationship with health. Over the course of two days, the conference brought together 40 interdisciplinary speakers and 250 diverse participants through keynote addresses, breakout sessions, a panel discussion, a community partners and networking fair, and a research and practice showcase. After the conference, we are left wondering: how can we as change-makers continue to advocate and work towards equitable and action-oriented solutions to income insecurity? How can the lived experiences of those who have faced income insecurity, precarious work and discrimination be part of the solution. These are complex questions that could not possibly be addressed over two days, but we were inspired with some crucial takeaways. In public health, we are privileged to be exposed to a host of narratives from persons with lived experience. We have the power to shift the narratives of persons with lived experience to the forefront of discussions that impact their lives the most with respect to income insecurity. We need to be aware of the untold narratives, which are not considered, but are paradoxically, the most affected in program planning, data collection and representation, and policy-making. For instance, we can highlight migrant workers’ hard work in farming the food that reaches our tables at lower than minimum wage rates, and the migrant workers who are community activists and caregivers to many children. We are responsible for breaking down barriers to collaboration by giving those with lived experience a voice in a meaningful and respectful way. This requires a genuine focus on similar interests, as opposed to the differences that can perpetuate imbalanced “us versus them” power relationships. Many speakers discussed the importance of the $15 and Fairness campaign. Currently, minimum wage is 16 percent below the poverty line. Along with limited rights, protections and unpredictable schedules, low wages contribute to a sense of powerlessness for precariously employed workers. The minimum wage campaign highlights the importance of having meaningful employment, at a living wage, for a sustainable and equitable economic development. The need to raise the working wage is inextricably linked to raising the floor — the basic level at which all workers’ rights are protected and enforced. This includes a worker’s ability to negotiate, having employers comply with worker’s rights, collecting equal pay for same level of work, etc. The current Ontario worker’s legislation, the Employment Standards Act (ESA), provides minimal protection to vulnerable workers navigating today’s precarious work climate and low-wage economy. The Changing Workplaces Review gives us a historical (first time in 20 years) and important opportunity to address the growing precariousness of the labour market by improving legislative protections, such as the ESA. Numerous community consultations, advocates and special advisors from across sectors, including public health, have put forth their recommendations for this review with hopes of supporting decent Ontario workplaces and economy. Moving forward, public health professionals must support new employment legislations that support fair and equitable work. And if they do not, we must ask ourselves how can we continue building the momentum for another policy window. Basic income has been an idea for a long time, and through several examples of where it has been implemented successfully — including in Manitoba, Alaska and Brazil — it is now being tested in Ontario. We were challenged to think about basic income and how it fits into the greater social safety net. Basic income alone will not be able to address issues such as precarious work. When implementing basic income, it should not be considered alone, but in conjunction with other existing social programs. In the coming months, it will be of interest to see public health’s involvement in this project, and whether lessons learned from previous examples will be considered within Ontario’s context. Ultimately, the discussion of income insecurity has several key players but we need to ensure that public health has a seat at this table and is actively part of the discussions surrounding income security, whether we are already invited or if it requires advocating for our place. We hope that our conference has inspired you to move this discussion forward and advocate for income security and a fair, just society for all.